Alaska internet advertising for fishing lodges, guides and charters. Our discounted directory listings and links will bring serious sport fishermen to your website at the lowest possible cost. “Standard Listings” ( up to 60 words and a link to your website) in any or all of the below Alaskan fishing directories. Only $150 for any 1 listing for an entire year. And only $75 for each additional listing. 1/ AlaskaOutdoors.com .......................................... " Fishing Guides & Charters "
2/ AlaskaOutdoors.com...................................... " Fishing Lodges & Resorts "
3/ AlaskaOutdoors.com .................................................... " Fly Fishing "
4/ AlaskaFishGuides.com .................................. " Guides & Lodges "
5/ America-Outdoors.com ................................ " Alaska Fishing "
Master card and visa are welcomed. lodges and businesses that have used our services since 1996. Listings and links guaranteed to be posted within 48 hours. Add an additional Regional Listing (up to 100 words), plus graphics (2 pictures) and links to your website in either of our new Alaska Regional Directories for only $150 additional. More details and more pictures of your buiness than in any other directory.
" Standard Listings " ($150.00 annually) - Your business name linked to your homepage with up to a 60 word description of your services is displayed alphabetically within your region of the state. Standard listings appear below all Sponsor listings. “ Sponsor listings " ( $375 annually ) - Your business name in Bold and with a star at the top of the directory webpage ( your listing is displayed before any standard listings increasing your advertising exposure). Unlike some directories, your sponsor listing is displayed in the order received (not alphabetically) and will remain in it's priority position as long as your listing is renewed. For information on special banner ads, hosting and website design, please click here. 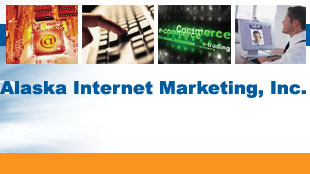 We are committed to bringing you the best service and finest Internet hosting and advertising solutions available.